I’m back from SIS17! I had a blast, got to hug a lot of friends, and sold a whole bunch of stuff! All unsold stock will be added to my online store later this week! In less fun news; due to the recent controversy regarding the changes made to the ToS – which has since been undone – I am halting all updates of my comics to Tapastic until further notice. I need to sort out my own feelings, and am considering other options for Grassblades. However, this website isn’t going anywhere, and will remain the best place to read this comic! I like her, she’s so sensible. I get the feeling that it’s going to become Masa’s fight one way or the other though… Whether he likes it or not. Yeah, unless Masa wants to its better that they don’t ask anything in fighting a fight that isn’t his. Go Princess! I’m happy we can read this here, Taptastic is very hard to read on because my computer does not like to scroll down smoothly. I can live with one page at a time. BTW, this is a great comic, and I am enjoying getting into the story now! Thank you! 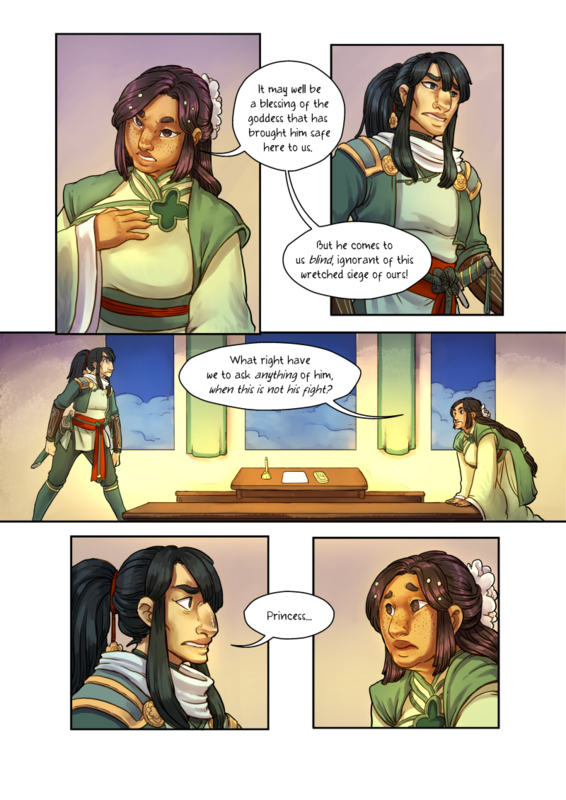 <3 Grassblades was never really formatted properly for Tapastic, since I'm old-school enough to still do my comic in page-format, rather than arrange the panels for vertical scrolling. Happy to hear someone enjoys it that way! It may not have BEEN his fight, but I think it probably is now. He does seem to be on a bit of a time crunch, after all.